Convention centers owe their flexibility to their large, open floor plans. However, cladding and design often relegate these spaces into artificially illuminated and difficult to navigate venues for users. 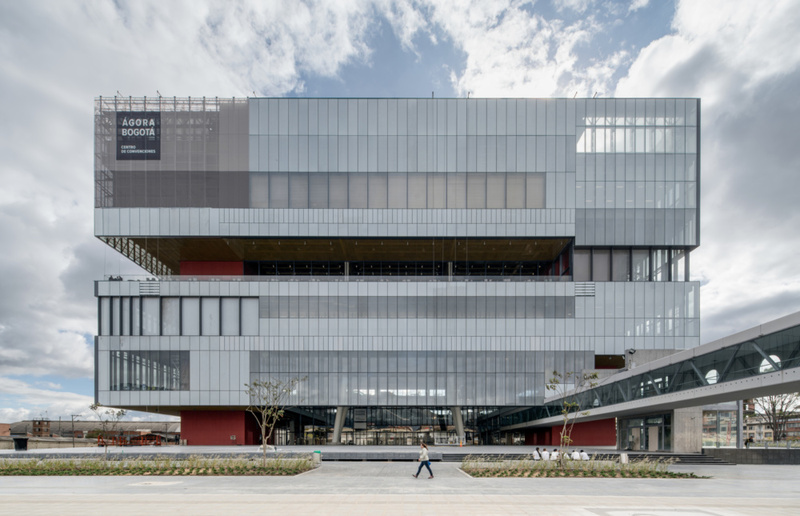 Estudio Herreros and Consorcio Bermudez Arquitectos’s Ágora-Bogotá, located in Colombia’s capital, responds to this stylistic quagmire with a multifaceted glass facade consisting of ten different treatments and electronically-controlled gills. The program of the 753,000-square-foot building blends significant public areas with more intimate meeting rooms and service areas. Different treatments of glass correspond to the acoustic and daylighting requirements of the various spaces. The 1,600-panel cladding system is tied to the overall structure via a network of large modular aluminum frames, with the glass panels ranging in size from approximately 4.5 feet by 8 feet, to 8 feet by 35 feet. According to the design team “the facade panels are mainly fastened by three-dimensional anchor elements made of stainless steel specifically designed for the project, being screwed to the edge of concrete slabs or being welded to the metal structure." Rather than relying heavily on energy-consuming heating and cooling systems, the Ágora-Bogotá uses its facade to moderate heat gain and loss. The east-facing facade is largely composed of single-glazed window panels to maximize solar gain in the morning hours. For the west-facing facade, the glass panels are imprinted with a dense silk screen pattern—an exterior-facing white pattern and interior black impression—to filter the stronger afternoon glare. In total, ten different glass types can be found across the building's elevations, which maintain a thermal transmittance below .704 BTU/per hour/per square foot. As a result of the many treatments and sizes of the glass panels, the visual qualities of the Ágora-Bogotá dynamically shift throughout the day and in different weather conditions. The facade is studded with a network of "ventilation gills" controlled by an electronic sensor system capable of tracking temperature, sunlight, and humidity. To cool the structure, the gills draw in Bogotá's mild weather—the city's temperature peaks in summer around 70 degrees farenheit—into its many conference halls and offices. In 2018, the project was awarded the "Best Project" prize at the Colombian Architecture Biennial, and the Madrid Architects' Association Global Practice Award. 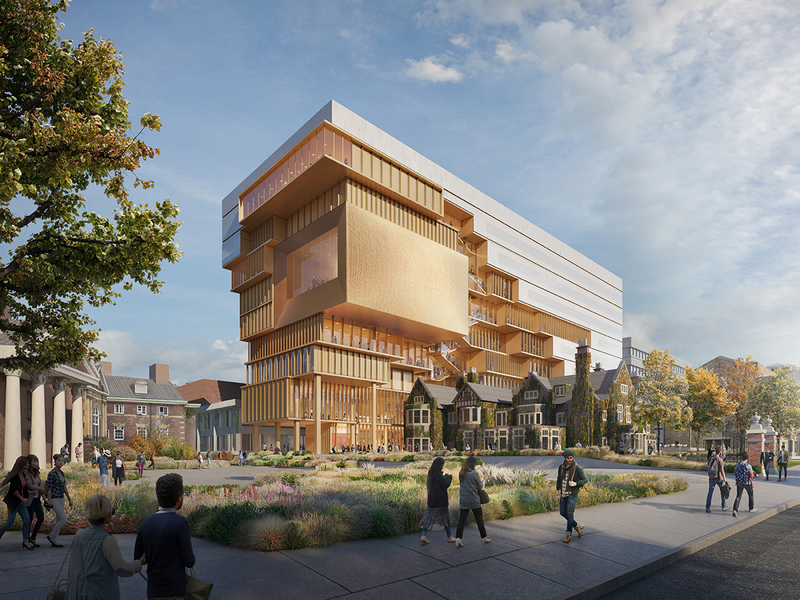 Diller Scofidio + Renfro has unveiled the design for a 170,000-square-foot stacked building at the University of Toronto (U of T) to be known as 90 Queen’s Park. Set on the site of a former planetarium, the interdisciplinary structure will serve nine previously-dispersed departments at U of T, but will specifically house the university's newly-established School of Cities, a global hub for urban-focused research, education, and outreach. DS+R was awarded the project after winning a 2016 design competition in which the New York–based firm collaborated with two practices from Toronto, architectsAlliance and ERA Architects. The result of their efforts is a looming, boxy building that appears to shine with a coppery metallic finish. The most important part of the design, according to the architects, is the surrounding context. It’s bordered by Queen’s Park to the east, the Royal Ontario Museum to the north, the 1960s-era Edward Johnson Building to the west (home of U of T’s Faculty of Music), as well as Flavelle House to the south, a Victorian-style structure housing the Faculty of Law. DS+R’s intervention to the nearly-200-year-old university will be among its most stand-out modern structures when complete. With a rectangular design configured to fit like a puzzle piece around the adjacent Falconer Hall, the school’s original, 118-year-old law building, it's meant to seamlessly connect U of T’s arts, architecture, and legal institutions with one another. Stilted on one end, 90 Queen’s Park features nine distinct layers. Renderings show each level includes varying facades of ribbed glass with some floors set back and others slightly cantilevered for flare. A large, concaved window overwhelms several middle floors on the south facade of the structure and serves as the backdrop to a 200-seat music recital hall. The architects designed the performance space around the large opening to show off views of southern Toronto’s skyline. At the top of the building is a 400-seat event space featuring floor-to-ceiling windows that wrap the southern and eastern edges of the building, also providing sights of the city. DS+R describes this part of the exterior as eroding from the other sides of the building. To the right of Falconer Hall facing Queen’s Park, the structure boasts 10 strips of opaque glass that are cut off at different lengths. The transparent sections reveal interior corridors, public spaces, as well as the central atrium and spiraling stairs, while the more solid ends conceal classrooms and offices. Charles Renfro, cofounder and principal of DS+R, said in a statement that the building’s dynamic design is aimed to inspire collaborative discourse and public engagement. “This ‘campus within a campus’ is revealed in the building’s dual identity—a smooth cohesive block of faculty offices and workspaces gives way to a variegated expression of individual departments as the building is sculpted around Falconer Hall,” he said. In addition to housing the School of Cities, 90 Queen’s Park will include room for classes within the Faculty of Arts + Science, including history, Near and Middle Eastern civilizations, and the Institute of Islamic Studies, as well as the Anne Tanenbaum Centre of Jewish Studies. Some space will also be dedicated to the Faculty of Law, the Faculty of Music, while other gathering areas will be used by the adjacent Royal Ontario Museum. U of T’s School of Cities was created last year to combine the Faculty of Architecture, Landscape, and Design with community-based research initiatives dedicated to solving the world’s biggest urban issues. In a press release, Richard Sommer, dean of the department, noted that the building’s outward face is of particular importance. “The edges of the campus and its borders with the city are the places where you engage the community and the vibrancy of the city of Toronto,” he said. “When you have buildings that are at these edges, it’s particularly important that they have programming that produces a platform for public exchange.” Set to break ground in 2020, the project will also include a large entry plaza to the north that will feature a terraced landscape, as well as a cafe and restaurant. Architectural heritage is something of an anomaly in the city of Abu Dhabi, the capital of the United Arab Emirates. Since 1950 the city has grown from 4,000 residents to nearly 1.5 million, many of whom are housed and working in miles-long rows of concrete tower blocks. The 18th-century Qasr Al Hosn castle stands as a rare historical monument in this remarkably modern city, and the local government just recently completed a decade-long architectural conservation program restoring and stabilizing its masonry walls. The Qasr Al Hosn was built by the ruling Bani Yas tribe in the 1760s as a coastal bastion defending the city’s fresh water well and regional trade routes. The walls and towers are built of coral and sea stone and are lathed in a render composed of burned and crushed seashells mixed with white sand and water. Rich in minerals, the render takes on a bright white and iridescent finish that glints under the sun. Apertures are located throughout the concentric rings of walls, naturally drawing ventilating gusts throughout the complex. And as a virtue of the thermal mass of the formidable walls, the sequence of courtyards is considerably cooler than the surrounding city. After centuries of wear and tear, as well as the ill-thought coating of the original masonry with a thick cementitious render and decorative layer of white gypsum, the castle was due for a significant restoration. The restoration of historic structures, especially those of major cultural significance, requires painstaking material and historical research. The Department of Culture & Tourism (DCT) deployed a team to “carefully remove strips of the modern render layer which enabled us to determine that a high extent of original masonry was still intact and to discover that the original render was still in existence in areas,” said Mark Kyffin, DCT Head of Architecture. “This enabled us to analyze the constituent parts of this material, under laboratory conditions, for replication and application in the ensuing remedial works.” With the information gathered by laboratory observation, the team developed a new render replicating the porosity and thermal qualities of the old. Research of preexisting masonry sections also provided insight into its original hand application, a process appropriated by the modern construction team. While the use of render shields masonry from the elements—think of it as a coated rainscreen—the condition of loadbearing elements determines the structural longevity of the building. The walls that surround the complex are just under two feet in width, with significant voids caused by internal stone deterioration. To fill these voids, the DCT set up a gravity-injected mortar grouting system. "Loose mortar was removed from the external facing masonry joints and temporarily replaced with cotton wool," said Kyffin. "This enabled the wall to be a sealed enclosure and prevented grout from seeping through the facade." The external cotton wool was removed once the internal grout had cured, with gaps in the masonry subsequently being repointed. Historical research also played a significant role in the conservation process. Researchers pored over photographs, diary extracts, and oral testimonies of those who lived in the building during the 1940s, gaining further knowledge of key building features. Abu Dhabi is surrounded by desert. For centuries, the city exclusively sourced its timber from an adjacent and expansive mangrove forest. The dimensions of internal rooms were dictated by the maximum height of the local mangrove forest; the tallest mangrove poles can measure close to twenty feet. In conjunction with the restoration of the Qasr Al Hosn, the Department of Culture & Tourism collaborated with Danish architecture firm CEBRA to landscape nearly 35 acres of open land surrounding the castle. Also unveiled in December, the design features polygon-shaped concrete formed to resemble the sun-baked earth and rolling water features that course pass shade-providing vegetation. Farren International, a one-stop-shop logistics operation founded in 1959, has carved a niche for itself shipping extra-extra-large items. Operating across most of the European Union, North America, and the United Arab Emirates, the outfit transports over one million tons per year globally by plane, train, and automobile (and a significant number of cargo ships). The company’s principal storage facility, a 400,000-square-foot warehouse in Ledgewood, New Jersey, is littered with shrink-wrapped Chinook helicopters, stacks of Yamasaki motorcycles, and 30-foot power turbines, among other items. Over the last decade, Farren International has embedded itself in leading mega-developments across New York City, transporting all of the facade cladding for towers such as New York’s Freedom Tower, and 15 and 55 Hudson Yards. With a fleet of 75 heavy-duty brand trucks, such as Oshkosh, Peterbilt, and Kenworth, Farren International has established itself as an expert in the transport of superloads—an indivisible load surpassing 16 feet in height and width, 125 feet in length, and in excess of 200,000 pounds—or as CEO and president of Farren International, Phil Antonucci, puts it, cargo that is “high, wide, and heavy.” The herculean task of corralling facade components from across the globe is often overlooked in the construction process: It includes the warehousing of thousands of tons of material in an orderly fashion and ultimately shipping components to construction sites. An in-house workshop at the New Jersey facility—hidden behind countless shelves and mountains of cargo, including enormous turbines and transformers—is charged with customizing flatbeds and other means of specialized transport for particular items. Considering the sheer lumbering mass of these transports—formats include tandem trucks hauling up to 140-foot-long modular trailers—plotting routes is akin to planning a minor military campaign. Scouts armed with measuring instruments and high poles spend up to one month at a time surveying potential routes, testing corners and overpass heights to ensure that convoys arrive at their location undamaged and on time. 15 Hudson Yards Diller Scofidio + Renfro’s recently completed 15 Hudson Yards is a 910-foot-tall residential skyscraper clad in a multitude of facade materials. For the project, Farren International collaborated with Related Companies–affiliated New Hudson Facades to transport curtain wall panels to the construction site. Assembled just south of Philadelphia, the panels were first trucked more than 100 miles to Farren’s multi-acre storage facilities in New Jersey. 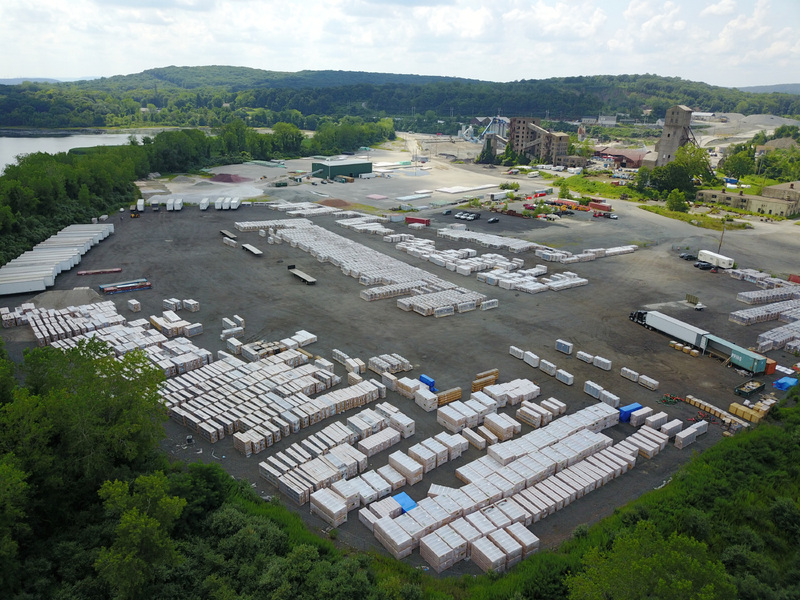 Over the course of two years, Farren shipped approximately 36 panels a day to the construction team on the ground for erection, with the panels weighing between 3,000 and 5,000 pounds each. Transformer Transport When Farren International is not transporting hundreds of tons of facade components or hulking military equipment, the logistics operation is moving crucial infrastructural components across the globe. In 2016, the team plotted the journey of a 415,000-pound transformer from a manufacturer in Brazil to Port Newark in New Jersey. From this juncture, the team loaded the transformer onto a barge that was pushed up the Hudson River and through the Erie Canal to Rochester, New York. Once on land, the transformer was lifted onto a Goldhoffer trailer, pushed forward by two tandem Oshkosh trucks, and installed at a local electrical substation. Chinook Helicopters The CH-47 Chinook is a 99-foot-long heavy lift helicopter with a potential payload of over 10 tons. When decommissioned by the United States Armed Forces and other purchasers of Boeing’s military-industrial wares, Chinooks begin new lives as civilian aircraft. Since 2014, Farren International has transported dozens of these double-rotor helicopters—2,500 miles on land from Meridianville, Alabama, to Columbia Helicopters in Oregon—on their fleet of flatbed trucks with an in-house-designed set of fittings and equipment, including customized nose and wheel cradles and upgraded lifting devices. In addition to the Chinook, Farren International transports a motley crew of smaller aircraft, including the Sikorsky S-92, the UH-60 Blackhawk, and even decommissioned Air Force Ones. The district of Pudong in Shanghai has exploded over the last two decades with approximately 10 percent annual population growth, while the city’s skyline has soared eastward to the East China Sea. FGP Atelier, a Chicago-based firm founded by Francisco Gonzalez-Pulido, has imprinted its distinctive style in the district with the Land Rover tower-and-retail complex featuring a ceramic fritted glass facade. The complex is spread over a 185,000-square-foot campus, with the two 21-story towers located on the northeastern and southwestern corners. The ceramic frit pattern, which extends from the towers to the two-story retail spaces ringing the development, is both practical and symbolic. Covering up to 35 percent of the facades, the ceramic pattern is a sun filter that also conceals interior support columns and other infrastructural details. Symbolically, the diaphanous pattern evokes the dense foliage of China’s bamboo forests. “The organic feel that results balances the regularity of the plan and allows the building to change as light hits the various surfaces in different manners,” said Gonzalez-Pulido. 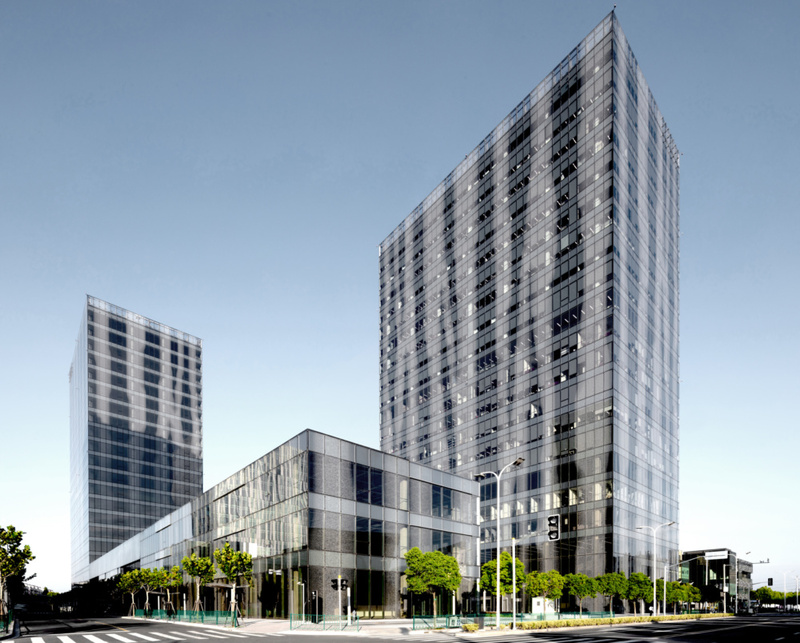 “This transformation is particularly present as the sun sets and the building glows from within.” Produced by Chinese-manufacturer Yuanda, the custom glass unitized curtain wall consists of a triple layer laminated design, with the ceramic pattern in the third layer. Because making every 5-by-15-foot facade panel unique would be too expensive, FGP Atelier arranged 52 patterns with a parametric design tool that mirrored and rotated different panels into a rationalized layout. While the overall approach remained consistent throughout the design process, shifting government mandates forced the design team to regularly go back to the drawing board. Originally, FGP Atelier wanted facade panels to be over 50 percent covered by the ceramic frit. However, governmental concerns regarding the quality of Chinese ceramics dictated that at most only half of each panel could be covered. The design team addressed this challenge by hollowing larger ceramic components while maintaining the original pattern. As the project moved forward, another spanner was thrown into the works by the local regulatory body. Because of concerns regarding the reflectivity of the glass curtain wall, Shanghai's building department dictated that FGP Atelier incorporate stainless steel fins—a reflective material—to dampen the iridescence of the curtain wall. To reduce the obtrusiveness of this element from the otherwise smooth facade, the design team opted for black-coated stainless steel, which effectively mirrors the pattern of the ceramic frit. In 2015, the Norwegian Trekking Association announced a decision to construct two warming huts along the mountains that ring the town of Hammerfest to encourage hiking for both residents and tourists. The project brief called for a straightforward structure with a working wood-burning stove, an excellent view of the surrounding landscape, and suitability for the mountainous terrain. Norwegian-based practice SPINN Arkitekter and Britain’s Format Engineers answered this call with a cross-laminated timber shell with exterior Kebony panels. One of the initial challenges of the project was to design a form that both blended in with the rugged setting and endure the harsh mountainous weather conditions. The first step in addressing these conditions called for the 3-D mapping of the two sites with a drone and photogrammetry software. With this territorial information plugged into Rhino Kangaroo and Grasshopper files, the team was able to craft a series of visual models for the project and a series of components that could be easily transported across the mountainous terrain for erection. "Snow simulations were performed to ensure that the entrance will remain snow-free as intended," said the design team. "Structural forces between the panels were determined to specify the correct type of screws and fasteners for the construction. Additionally, 3-D printing was used extensively to test out how the construction would fit together, and to test cladding options for the exterior." 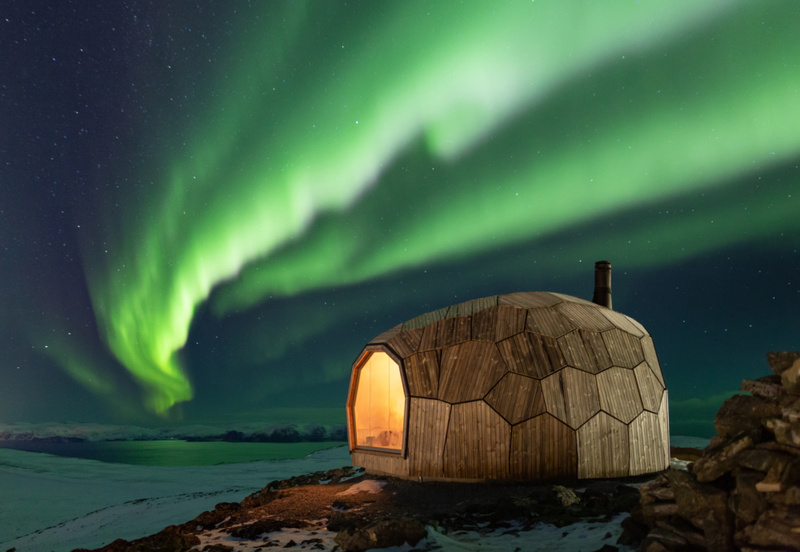 The rock-like cabins effectively consist of three layers: a 3-inch-thick CLT shell, a 1/8-inch-thick membrane, and a Kebony skin with a thickness measuring just under 1 inch. 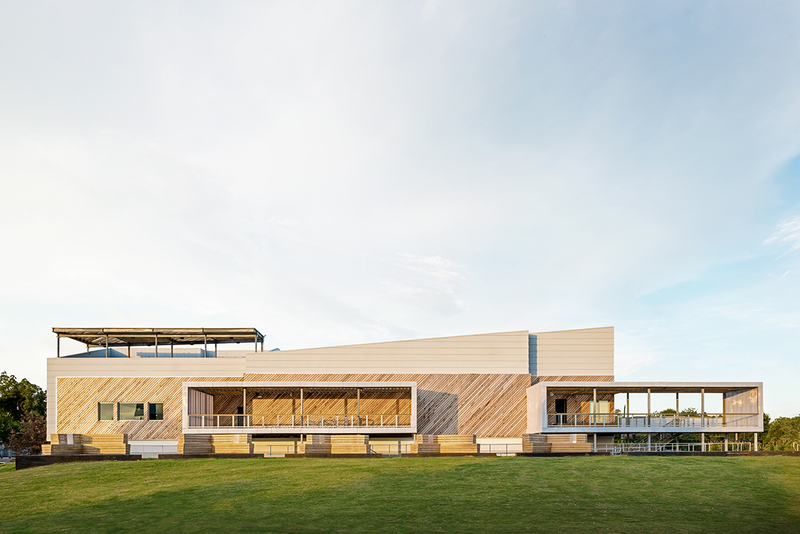 A system of frames and blocks are located between the exterior cladding and the CLT core. Two sets of 3.5-inch-thick screws are found on each tile edge, connecting to adjacent tiles and the overall structure. An initial prototype of the $100,000 cabin was constructed in a controlled warehouse environment to allow for the uninterrupted testing of component assembly. Over the course of four workdays, two groups of volunteers assembled the cabin's shell and cut the cladding panels. Following construction, the cabin was split in two and transported via flatbed truck to the site and craned into position for final assembly. Construction of the second cabin is currently in the works. 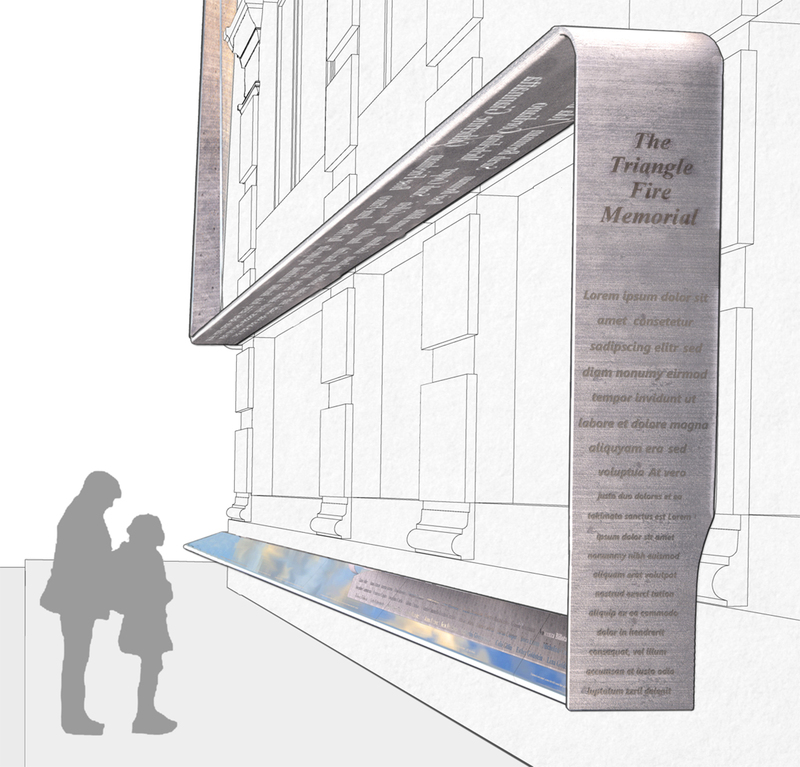 Last week, the New York City Landmarks Preservation Commission voted unanimously to approve a memorial dedicated to the 146 victims of the Triangle Shirtwaist Fire of 1911. 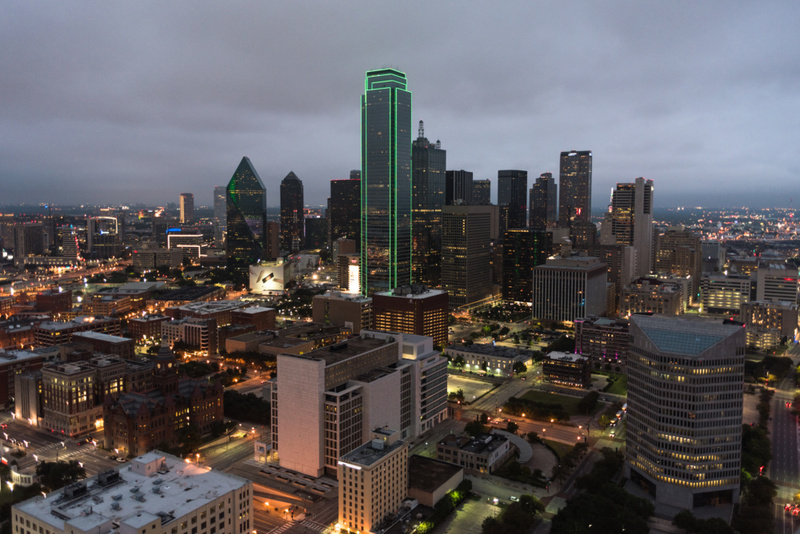 Reframing the Sky, designed by architects Uri Wegman and Richard Joon Yoo, will debut next year if supporters can raise $850,000 to cover long-term maintenance costs. The commission’s approval is the latest step in what’s been a six-year-long process to install the project in commemoration of the tragedy. Gina Pollara, a consultant with the Remember the Triangle Fire Coalition, said now is the perfect time to get it done due to heightened awareness on labor rights issues in the United States. “Given the current political climate, I’m hoping this project begins to really open up the conversation about the importance of unions, workplace safety, and how we can address certain social justice issues today,” said Pollara. “For all of their imperfections, unions still perform a vital duty and are an important piece of the American labor force.” The factory’s infamous fire, now 108 years ago, set off a series of historic legislative reforms to protect workers’ safety. The employees who died there, many of which were young immigrant women, were trapped on locked floors of the multi-level facility at 29 Washington Place. Today, the structure, known as the Brown Building, is owned by New York University and though it’s a local and national landmark, many people don’t know its history. The coalition seeks to change that through a public memorial that shines a light on the tragedy and details its significance for blue-collar workers in the 21st century. According to the project statement, the future memorial will mimic the mourning ribbons that were traditionally draped on building facades as outward expressions of a community’s collective sorrow. It will feature horizontal stainless-steel bands that wrap the southeast corner of the building and a textured panel that lines its vertical edge. The names of the victims will be laser cut into the elongated panels where daylight will shine and reflect the letters off a highly-polished, steel surface placed at hip level. Through this, visitors will be able to see the names reflected in the sky. The project has already received widespread support since its announcement in 2013. Three years ago, Governor Andrew Cuomo approved a $1.5 million grant for its design and construction, but money is still needed to maintain it. The coalition is organizing a two-day upcoming event in collaboration with the Fashion Institute of Technology to raise awareness of the project and offer people the chance to contribute to its design. Anyone interested will be able to bring an individual piece of fabric that will be used to create a large ribbon that the designers will cast in metal and mount onto the building for the textured vertical panel. “The public engagement piece of this memorial is the most important part to us,” said Pollara, “because the legislation that came from this tragedy has affected us all personally whether we know it or not. The design features a very subtle thread of stitching the past and present together.” A public event, A Collective Ribbon — Weaving Stories of the Triangle Fire, will take place on March 16 and 17 at the Fashion Institute of Technology. Those who are unable to attend can send in personal pieces of ribbon to the Remember the Triangle Fire Coalition at PO Box 1822, New York, New York 10113. Donors of $25,000 or more will have their names inscribed on the memorial. College dormitories are sometimes drab affairs, utilitarian in their design and timid in their expression. 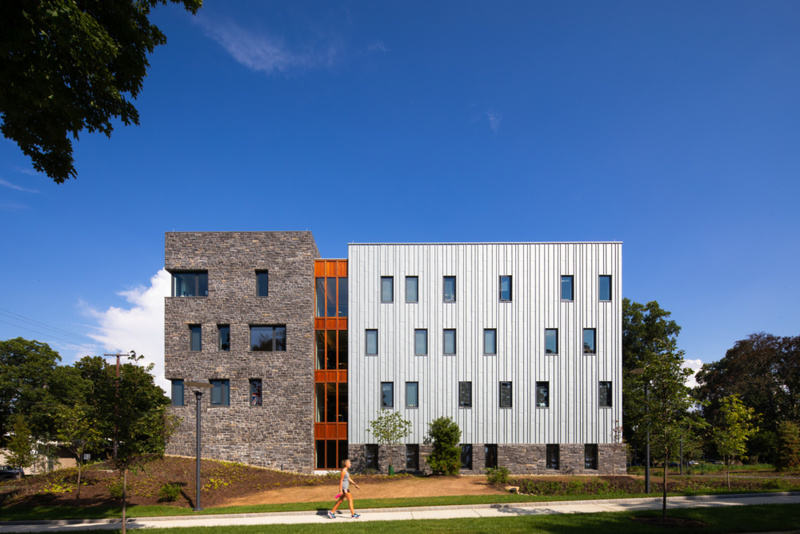 But Deborah Berke Partners’s (DBP) Dickinson College High Street Residence, completed in September 2018, uses a limestone masonry and paneled-zinc facade to create a bright and confident presence on campus. Facade Installer Novinger's Inc. Caretti, Inc, Hershocks, Inc.
As the building's name suggests, the 42,000-square-foot dormitory is located on High Street, which runs through Carlisle, Pennsylvania's historic core. Wanting to blend the dorm into its context of limestone Federal-style residential and institutional buildings, the design team created a four-story, roughly-cut limestone elevation whose three-dimensional surface creates a play of shadows. Alverson Limestone cladding supplied by Rolling Rock Building Stone is fastened to the north elevation with a block-and-plank structural system using masonry anchors. “The public-facing limestone mass of the new residence hall bookends the central campus on its western edge,” said project manager Aaron Plewke at DBP, “echoing the facades of its historic neighbors, but with a modern and minimal sensibility." Many secondary structures within the town and region, such as warehouses and sheds, as well as other buildings on Dickinson College's campus, are roofed with weathered zinc. The three campus-facing elevations wear this material strapped in a vertical orientation by thermally-broken brackets and horizontal rails. The building's restrained rectilinear massing is enlivened by moments of spontaneity in the facade. Irregular window openings are punched through all of the elevations, with those to the north deeply recessed within the limestone cladding. According to Plewke, "the pattern of the openings obscures the building's efficient, repetitive layouts, avoiding the undifferentiated facade that would have resulted from strict adherence to the plan." While most of the dorm's skin is made of stone and zinc, vertical bands of Sapele mahogany wood line entrances and principal community areas. Each of the three facade materials will patina into different hues while they are exposed to the elements over the coming years; the sun will bleach the dark-grey limestone ashlar, oxidization will darken the zinc paneling, and general exposure will darken the mahogany strips to a leaden complexion. 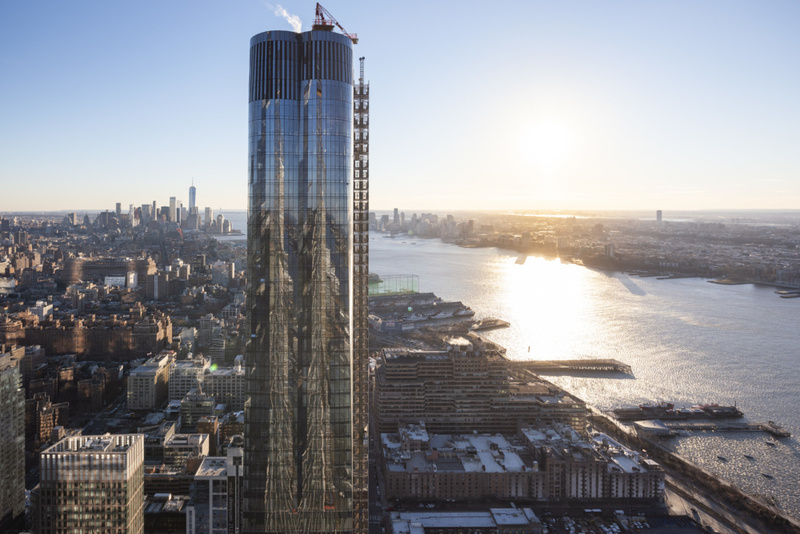 Diller Scofidio + Renfro (DS+R) and Rockwell Group's first skyscraper, 15 Hudson Yards, is now complete after four years of construction. The 88-story residential tower fuses the largest cold-warped glass curtain wall in North America with a louver and limestone base. The tower is located on the southwestern flank of Hudson Yards's first phase located on 28 acres between 30th and 34th Streets, and 10th and 11th Avenues. One of the sites many towers, 15 Hudson Yards alone will enclose a whopping 980,000 square feet. The 914-foot-tall project rises from a CNC-fabricated limestone base sourced from Carrara, Italy. According to the design team, parametric guidelines and 3-D modeling facilitated a seamless design-to-fabrication process for both the approximately 1800 stone panels and their steel support systems produced in Queens and New Jersey. The rear of each panel is studded with metal angles fastened to a network of bent plates attached to the steel support system. The Shed, also designed by DS+R and Rockwell Group, adjoins the smooth limestone surface of 15 Hudson Yards along a diagonal seam defined by polished and formed steelwork by CIG Architecture. Incorporating the dynamic performance arts space into the base of the tower presented a number of mechanical and structural challenges for the design team. The 48.7-inch-wide modules all have both a glass and ventilation louver component. The designers varied the ratio of the two pieces parametrically to best ventilate interior mechanical equipment, with the widths of the louvers ranging from 4 to 31 inches. Beginning at the 20th story, the tower dramatically curves using a cold-warped unitized glass curtain wall system. The individual glazing units, produced by German manufacturer Interpane, were cold-warped on site. To warp the glass components, the panels were held in trapezoidal frames with silicone seal joints that anticipated the final form of the panels once they were bent into place. While early renderings of the project depicted 15 Hudson Yards with anatomical undulations, cost constraints and manufacturer warranties straightened the design into its current form. “We worked very closely with curtain wall fabricators from concept through execution, and the tower’s form is a product of this close collaboration,” said facade consultant Neil Thelen. “Using a collaborative parametric approach, we were able to iterate and analyze the impact of the tower’s curved forms on critical parameters such as IGU cold-warping, aluminum extrusion die option, unique part and assembly reduction, gasket engagement, and window operation.” Above the amenity spaces located roughly halfway up the tower—which are clad with glass mega panels—the facade's curvature increases dramatically, effectively breaking into four turrets. The glass panels deflect up to 8 inches at the skyscraper's summit. Although the dimensions and material of the facade differ throughout the tower, the cladding all attaches to the structural frame with a similar technique. “There are embedded plates in the slab edges to which faceplates are bolted with adjustable screws to align bearing points for each wall unit. Each curtain wall unit has a pair of load bearing hooks at the top where the dead load is transferred to the building structure from the hooks,” said DS+R project director John Newman. “It hangs from there and interlocks with a large, gasketted tongue-and-groove extrusion at the top of the unit below.” In response to river-borne gusts, the facade is designed to withstand 100-year wind loads with a system of structural silicone profiles, mullions, and steel reinforcements for spans greater than twelve feet. Additionally, testing conducted by an independent lab determined the placement of supplemental-load bearing aluminum extrusions.